Popular Culture | Can you dig it? 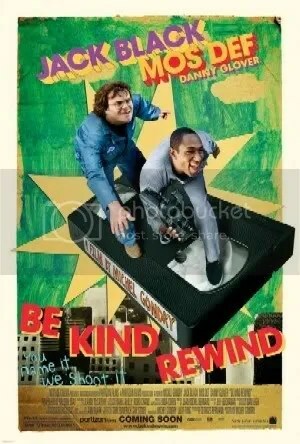 Michel Gondry’s new film “Be Kind Rewind,” besides being particularly endearing and funny, is a brilliant demonstration of how the user experience can be effectively reflected back to the audience. Due to a series of ridiculous plot contrivances (you won’t mind) two local shlubs are forced to create shorter, no budget (“sweded”) versions of popular movies for their local video store that only offers VHS tapes. Although pure fantasy, the movie works because it helps us realize why we love the movie-going experience and how we’ve internalized these sometimes low rent entertainments into our own everyday existence. We have been to the movies and they are us! Unlike those hundreds of amateur scene re-enactments you can find on youtube that try to show how talented their re-creaters are, Gondry taps into the communal nature of movie watching. He reminds us that movies can exist outside of their commercial realm and have a special place in our culture. He also allows us to believe that we can experience movies in a new way — by taking ownership of them and sharing that experience with our friends. The studios who own the rights to the actual movies featured in the film (“Ghostbusters,” “Driving Miss Daisy”) not only get to have their movies featured here, they provide the raw material for the love affair we have with all movies. I read somewhere that Gondry had real difficulty getting the rights to the movies that his characters so cleverly re-create in the film. The studios should be paying Gondry and Co. for the right to appear in his movie not the other way around.